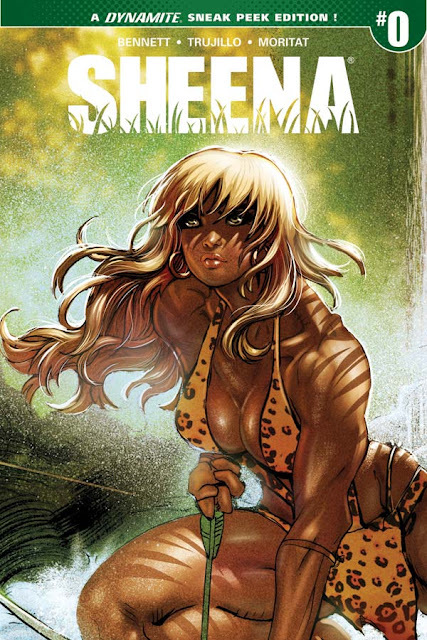 Things heat up this summer, as Dynamite Entertainment welcomes readers back to the jungle with the launch of their latest iconic character, Sheena! Written by the creative dynamic duo made-up of GLAAD-Nominated, NYT Best-Selling Marguerite Bennett (Batwoman, Animosity) and newcomer Christina Trujillo, with illustrations by Moritat (Hellblazer, Teen Titans), everyone's favorite Queen of the Jungle swings back into action on August 2, 2017, when issue #0 lands in stores! 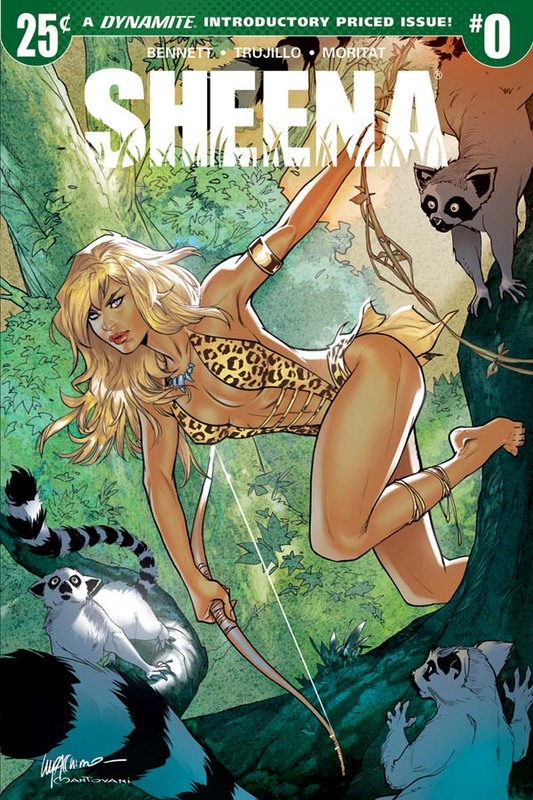 Sheena, Queen of the Jungle, was the first female character in comics to carry her own dedicated series beginning in 1937. Created by industry legends Will Eisner and S. M. "Jerry" Iger, this groundbreaking character saw 167 issues over the span of two decades. 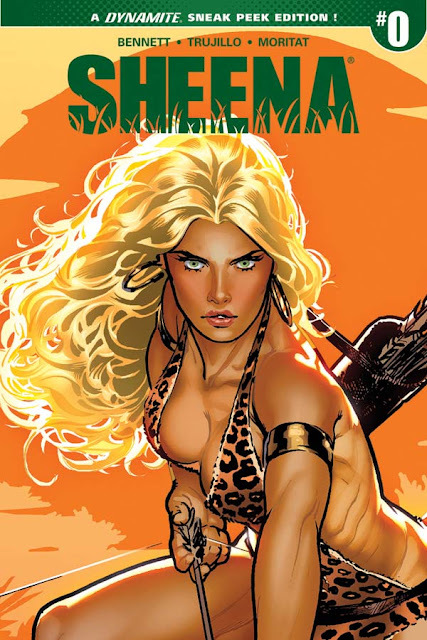 In this riveting relaunch, Sheena proves her prowess as the guardian of the jungle as she pursues a mysterious invader that has come to spy on the Amazon's most ancient secrets. Following the path of the trespasser, she encounters a forbidden ruin in which even more deadly dangers lie in wait -- and begins an adventure that will take her beyond her wildest imaginings! Writer Marguerite Bennett says, "Our story is glorious golden age pulp -- high adventure, quick wit, ancient mysteries, and daring dames -- clashing with the perils of two worlds: one, the modern world come to conquer, and one, a world of dark supernatural mystery long forgotten, awoken to anger once more. This is a fast paced, action packed kick off to more exciting adventures for Sheena!" Marguerite Bennett is the New York Times Bestselling, GLAAD-Nominated writer of Bombshells, Batwoman, A-Force, and Animosity, and is proud to introduce co-writer Christina Trujillo. Christina Trujillo adds, "Sheena is strong, brave, and willing to bend the rules in order to do her duty and keep her home safe. I think fans will enjoy having Sheena as a guide while they unravel the mysteries of the forest." A former student of Scott Snyder (Batman), Trujillo received an MFA in Creative Writing from Sarah Lawrence College in 2013, has seen her works published in the literary journal Dark Phrases, and was a finalist for Galaxy Press's Writers of the Future award. Artist Moritat says, "Stepping into Will Eisner's large shoes yet again, but this time wearing nothing but a leopard mono-kini. Marguerite Bennett's brilliant contemporary re-telling of this famous legend is my favorite to date. I can't wait to see if the fans like it." Dynamite Entertainment Executive Editor Joseph Rybandt said of the new project, "Sheena has long been a staple feature throughout the history of comics and we're especially proud to be adding new voices to that history. Marguerite and Christina present a timely and empowering tale - enhanced by the pitch-perfect visuals of Moritat - to create a Queen of the Jungle for the 21st century… and beyond." "Sheena is one of the strongest and most iconic characters in comics, and we're fortunate to be working with three incredibly talented creators. Marguerite and Christina make a great creative team giving Sheena a new voice, and is complemented by the lush artwork that Moritat brings to the series," says Dynamite CEO and Publisher Nick Barrucci. "We are incredibly proud of this series, and are launching it with the same program we launched Red Sonja #0 and Vampirella #0, with a .25 cent Introductory Priced issue. This allows retailers to stock up at a low risk so that as many fans as possible will have the opportunity to read the series. It's a program that worked successfully for Red Sonja and Vampirella, and we're doing so again with Sheena! I cannot wait for fans to check out the new series!" Sheena began her fictional existence as an orphan raised by a shaman in the jungle, perfecting her survival skills and mastering the ability to communicate with animals. Her many adventures brought her into conflict with evil hunters, slave traders, and rampaging wildlife. The character has thrilled audiences in several television and film adaptations, including portrayals by actresses Irish McCalla (1955-1956), Tanya Roberts (1984), and Gena Lee Nolin (2000). 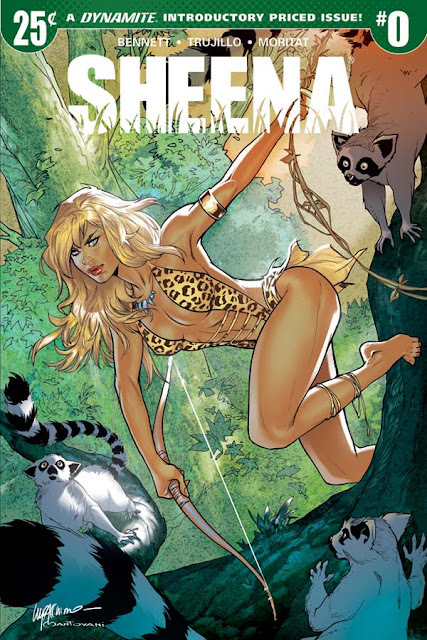 Dynamite Entertainment has a long history of publishing jungle fantasy and pulp adventure, making it the perfect home for Sheena! Cover artwork for Sheena #0 spotlights the talents of the Emanuela Lupacchino (Starfire, Supergirl) with limited variant editions including "Sneak Peek" covers from interior artist Moritat, as well as from Ryan Sook (X-Factor, The Spectre) and J. Scott Campbell (The Amazing Spiderman)! Sheena #0 will be solicited in Diamond Comic Distributors' June 2017 Previews catalog, the premier source of merchandise for the comic book specialty market, and slated for release in August. Comic book fans are encouraged to reserve copies of Sheena #0 with their local comic book retailers. Sheena #0 will also be available for individual customer purchase through digital platforms courtesy of Comixology, Kindle, iBooks, Google Play, Dynamite Digital, iVerse, Madefire, and Dark Horse Digital.